WASHINGTON, D.C. – Activists around the country are holding about 100 events to mark the 53rdAnniversary on July 30thof the adoption of Medicare and Medicaid, and to highlight the effects that the proposed drastic cuts to these two programs and the Affordable Care Act (ACA) by the Trump Administration and the GOP in Congress would have on millions of elderly, low-income and disabled Americans. 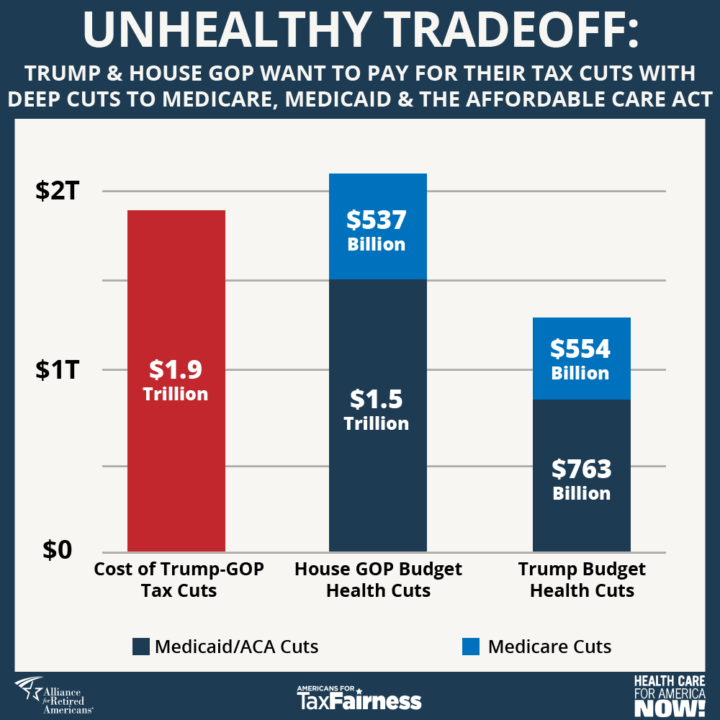 Seniors, parents, and health care activists are up in arms because the House Republicans and President Trump have proposed to slash these three programs by $2 trillion and $1.3 trillion, respectively, essentially to pay for the Trump-GOP tax cuts that cost nearly $2 trillion and primarily benefit the wealthy and corporations. [See chart below] As a candidate, Trump promised never to cut Medicare or Medicaid. Mostly organized by affiliates of the Alliance for Retired Americans and Health Care for America Now, the events coincide with the release of a comprehensive report prepared by Americans for Tax Fairness detailing how the proposed cuts to these bedrock health care programs will impact recipients in each state. The report also details how the tax cuts going to the richest 1% and corporations like prescription drug companies jeopardize Medicare, Medicaid and the ACA for millions of people of all ages. Reports for all 50 states are available HERE. An interactive map showing the time and place of the mobilization events scheduled so far is available HERE with additional events listed HERE. These events are focused on two top issues in the 2018 mid-term elections. Anniversary activities include protests at the offices of members of Congress who voted to repeal the ACA and voted for the Trump-GOP tax scam, birthday parties with lawmakers who voted to oppose both measures, and public testimony from people who rely on Medicare or Medicaid for their medical care. In addition to the various events planned in at least 26 states, there will be a Digital Day of Action on Monday, July 30 featuring a Tweetchat from 2-3pm ET. Participants are urged to follow #Medicare53 and/or #Medicaid53 to view or take part in the discussion. According to the ATF report: There are nearly 59 million Americans who depend on Medicare, and 1.5 million who make up the nation’s wealthiest 1%. The median income of Medicare recipients nationwide is about $26,000. By comparison, the wealthiest 1% have an average annual income of more than $2 million. Each will get a tax cut of over $55,000 a year on average under the Trump-GOP tax law, per the Institute on Taxation and Economic Policy.